Reeded border and reeded angular handle. Both sides with a laurel leaf roundel , one side initialled, the other vacant. 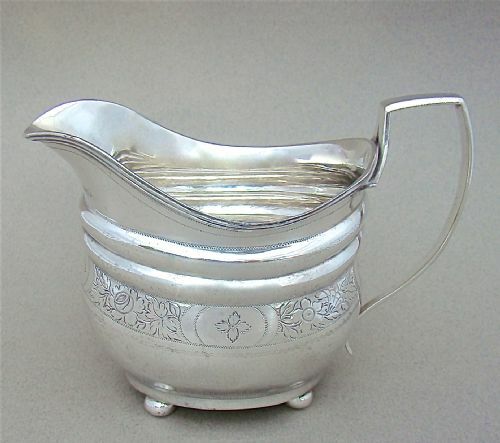 Length from spout to handle: 14cm / 5.4 inches. Weight: 114 g / 4 oz. Maker's marks partially worn but identifiable. Base a little uneven, commensurate with age but very stable. This is a very good quality solid silver caster made by the renowned Richard Comyns and dated London 1929. The cylindrical body with a bayonet fitted pierced cover surmounted by a fluted finial. Raised on spread pedestal foot with conforming decorations. Date letter "o" for 1929. Height: 18 cm - 7 inches. Weight: 213 g / 7 1/2 oz. Excellent condition, no dings or dents. 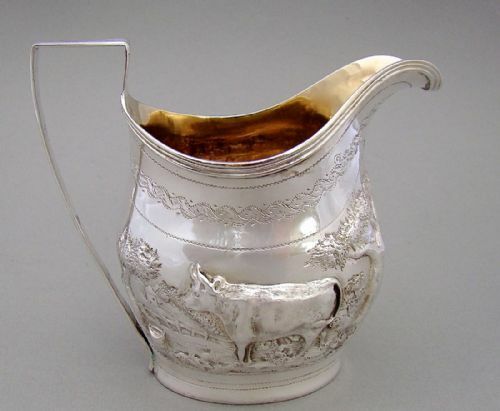 This exquisite George III silver cream jug was made by Duncan Urquhart & Naphtali Hart and is dated London 1789. Of oval bellied form, with a reeded border, it is finely bright-engraved with foliate patterns within prick-dot borders. The front with a vacant oval reserve. Raised on four ball feet. DU over NH for Duncan Urquhart & Naphtali Hart. Date letter "o" for 1789. Height up to handle: 9 cm / 3.4 inches. Length from spout to handle: 13cm / 5 inches. Width at widest: 6.5cm / 2.6 inches. Weight: 143 g / 5.1 oz. Minor surface scratching commensurate with age. 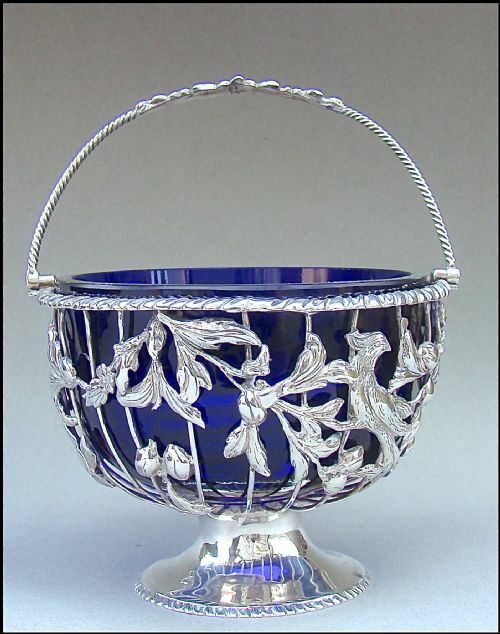 This is a rare and fabulous George III silver sugar or sweetmeat basket dated London 1769. Of generous proportion, the wire-work body applied with birds of paradise amongst fruiting branches. The sides with an articulated rope-twist handle, embellished by a floral garland. The rim with gadroon border. Raised on a circular pedestal foot with conforming gadroon border. Maker's marks "T. " partially erased, most probably Thomas Pitt, who was active in the 1760's and specialised in pierced works and baskets. Wirework in very good condition. Some very minor losses to the applied decorations , barely noticeable, metioned for accuracy. Foot and handle in excellent condition. Height up to handle: 16cm / 6.2 inches. Diameter: 11cm / 4.2 inches. Width: 9cm / 3 inches. Date letter "o" for 1786. Length from spout to handle: 13cm / 5.2 inches. Weight: 210 g / 7.4 oz. "Presented by Lord Poltimore to John Baker for merit in the cultivation of the turnip crop upon lands at Northmolton. Reeded border and flat angular handle. Date letter "F" for 1802. Length from spout to handle: 11cm / 4.3 inches. Weight: 103 g / 3.8 oz. 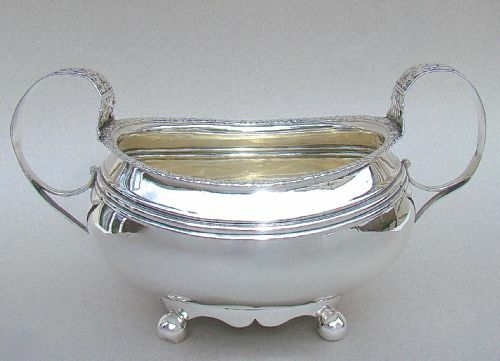 This handsome solid silver sugar bowl is dated London 1818 and was made by the sought-after silversmith Alice & George Burrows. Of oval bellied form, it has an apron base raised on four ball feet. The rim with foliate border. The flat bifurcated handles with foliate decorations. Pale gilt interior. It has a good gauge of silver, a testimony to its quality. Date letter "C" for 1818. Height up to handle: 11.5 cm / 4.4 inches. Length from handle to handle: 20cm / 8 inches. Width: 10 cm / 4 inches. Weight: 306 g / 10 3/4 oz. The basin sits firmly on its feet. Date letter faint but readable with eyeglass. 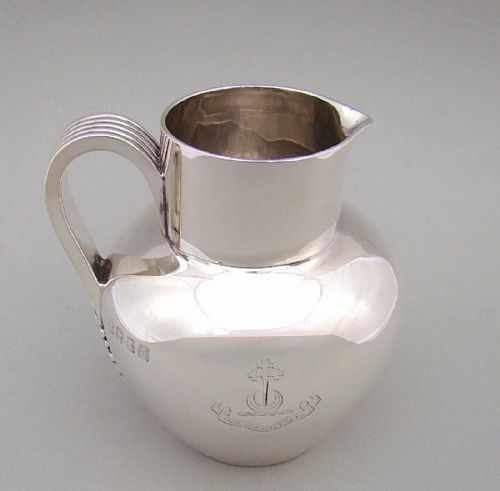 This Edwardian Scottish silver milk jug is dated Glasgow 1905. 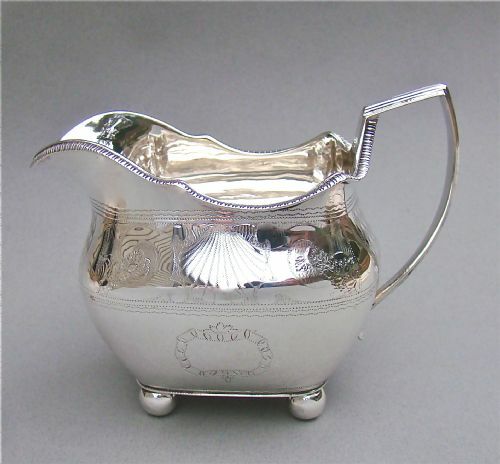 It was made by the renowned Scottish silversmiths and retailers George Edward and Sons of Buchanan Street, Glasgow. It is quite large, hence described as a milk rather than a cream jug. The capacity is 3/4 of a pint. The plain baluster body has a stylish reeded handle with stylised flower finial. One side engraved with a family crest. It has a very good silver gauge, weighing 8 ounces and bears Edwards retailers marks at the base. Date letter "j" for 1905. Diameter at widest: 11cm/ 4 inches. 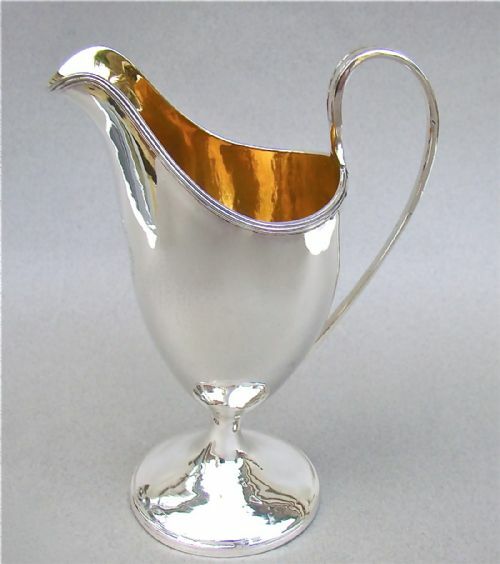 This classical Irish silver cream jug was made by George West and is dated Dublin 1796. Of traditional helmet form, with reeded borders, it iid plain and elegant. The front engraved with a crested medallion. Raised on a hollow pedestal foot. It has a very heavy gauge, a testimony to its fine quality. Height up to handle: 16 cm / 6.2 inches. Length from spout to handle: 12cm / 4.4 inches. Weight: 191 g / 6.7 oz. 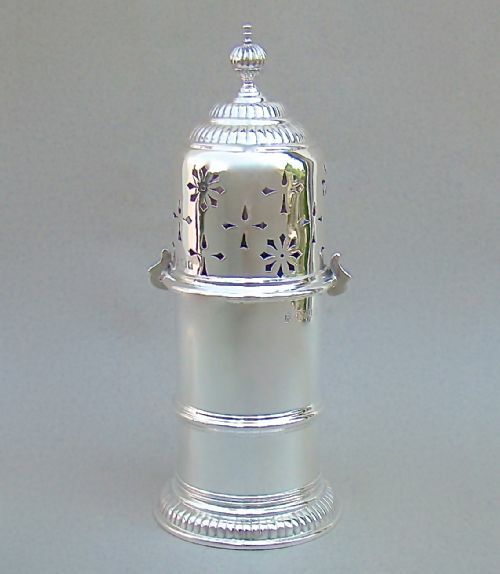 This is a very impressive silver sugar caster, measuring over 9 inches high. Dated Sheffield 1921 and made by the Lee & Wigful. Of conventional octagonal panelled form, it has an octagonal pedestal base and a pierced pull-off domed cover surmounted by a silver finial. HW (Henry Wigful) for Lee & Wigful. Date letter "d" for 1921. Diameter: 10cm / 4 inches. Weight: 276g / 8.8 oz. No loss to the pierced scrolls on cover. 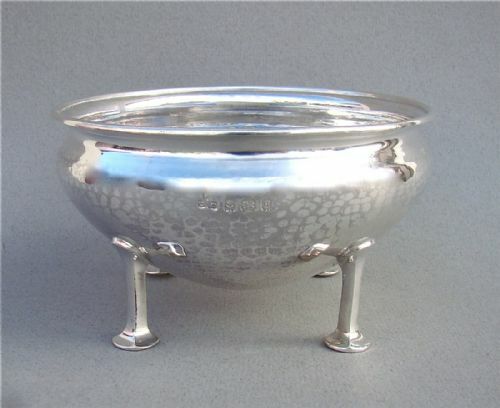 This fabulous spot-hammered Arts & Craft silver sugar bowl was made by the Arts & Craft maker George Lawrence Connell* and is dated Birmingham 1930. The hammered circular bowl with an everted rim and raised on four distinctive pad legs. *G.L. 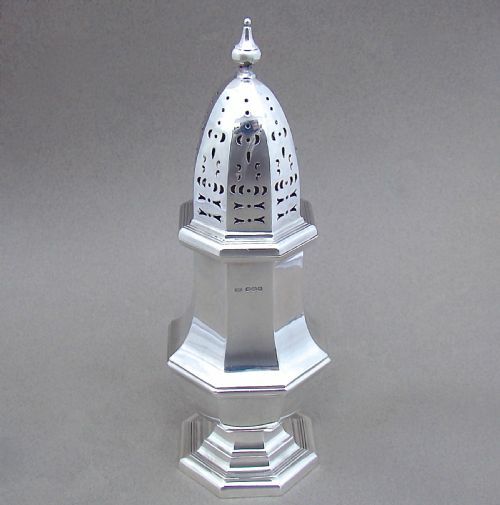 Connell is credited with introducing "modern, artistic silverware" to the firm's wares from the late 1890s. 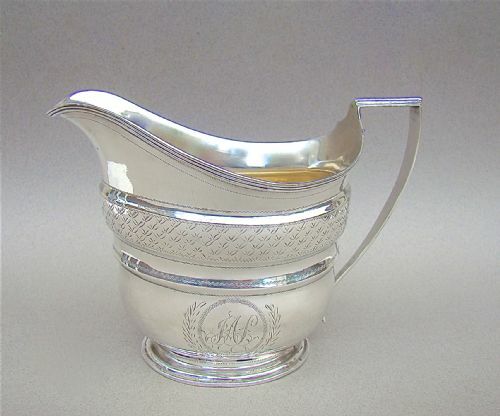 His wife Christine was a silversmith, whose work bearing the GLC maker's mark was sold by the firm, and who may well have had a hand in the design of this dish. Date letter "F" for 1930. Diameter:: 10cm / 4 inches. Height: 6cm / 2.3 inches. 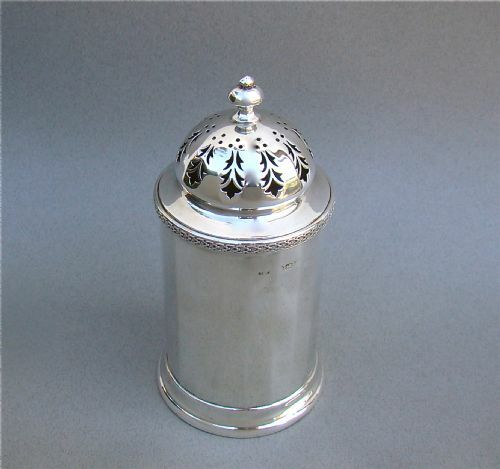 This is a fabulous silver sugar caster made in Birmingham 1929. Of panelled form, it has a pierced pull-off domed cover surmounted by a silver finial. It has a very good gauge, a testimony of its quality and feels satisfyingly heavy. Date letter "E" for 1929. Width: 6cm / 2.4 inches. Weight: 152g / 5.3 oz. No loss to the pierced slats on cover.